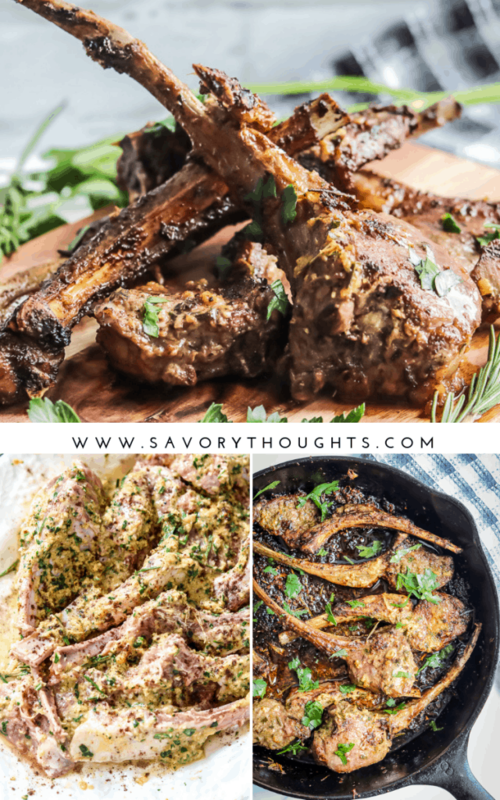 Baked Lamb Chops permeated with garlic herb flavors! 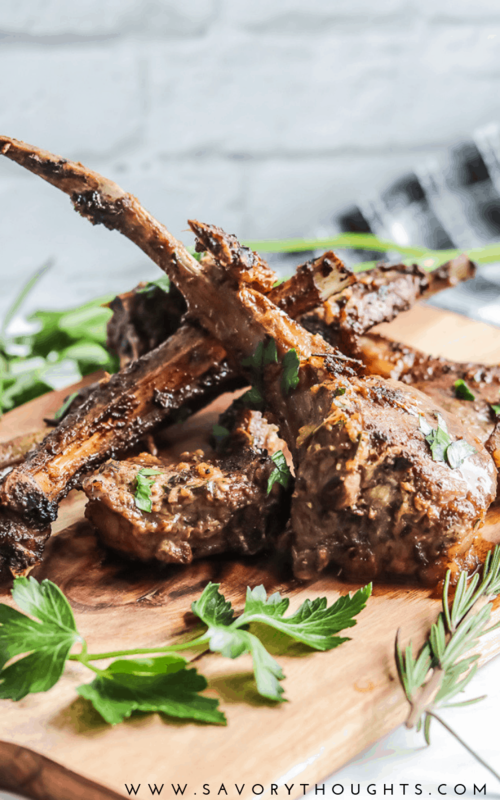 Marinated with mint to bring out the flavor of the lamb, then placed in the refrigerator for a little over 24 hours to ensure each bite is as rewarding as the first. It’s a low-fat baked lamb chops recipe that’s really tasty and incredibly easy to make. Pan seared lamb chops that are baked to perfection in accordance with your consistency level. Using small chops assures the lamb is moist and juicy. Perfect for any occasion and any time of the year. If I were to have a favorite meat choice, lamb would have to it. It is succulent, easy to make, high in protein, and very delicious. It pairs well with salads or rice dishes. Not to mention, great on the grill. For the marinade, I use garlic, fresh Italian parsley, fresh rosemary sprigs, salt, and pepper, EVOO, chopped onions, cayenne pepper (optional), allspice (optional), and mint leaves. Alter the recipe in any way that flatters you and your family. The key is to make it your own – the choice to add cayenne pepper is optional. Feel free to add a little, a lot, or none. The choice is yours! Add all the ingredients with the exception of the butter in a food processor. Pulse to smooth but somewhat lumpy consistency. Coat the meat well, cover with plastic wrap, sprinkle allspice, and refrigerate overnight but best at 48 hours or more. The next day, pan sear the lamb chops then pour the remaining marinade mixture over the lamb chops in the skillet. Coat well with a spoon. Baked for 6 minutes. Make sure that the lamb pieces are cut uniform size. When the rack is cut in even size, this assure that the meat is cooked evenly. Season Liberally. Adjust the measurement in accordance to your taste. Don’t Crowd the Pan. Overcrowding the pan may cause the meat to not cook evenly. If you made these Baked Lamb Chops Recipe, tag me on Instagram or Facebook so I can share your beautiful dish. Also, I’d appreciate it if you would give it a star rating below! SAVE THIS BAKED LAMB CHOPS RECIPE TO YOUR PINTEREST BOARDS! 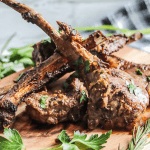 Baked Lamb Chops permeated with garlic herb flavors! Marinated with mint to bring out the flavor of the lamb. Pan seared, then baked to perfection. Add all the ingredients in small food processor including two tablespoon of the EVOO, with the exception of the butter. Pulse to liquify. Pour the marinade over the lamb chops, coat well. Sprinkle with allspice for additional flavor (optional). Cover with plastic wrap and refrigerate for up to 48 hours. In an ovenproof skillet, heat the skillet and olive oil. Pan sear the lamb for 2 minutes per side. Pour the remaining mixture over the meat in the skillet and bake the lamb on 400 degrees for 6 (medium rare) or 10-15 minutes for well done. 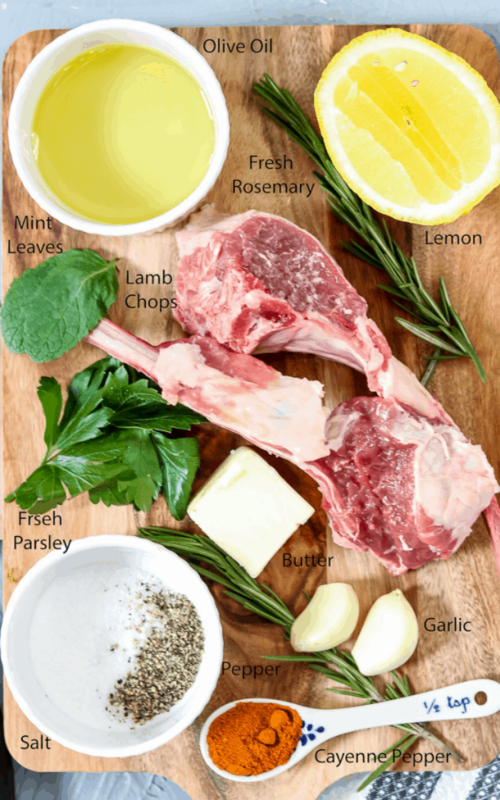 Lamb chops are one of my favorite cuts of meat, and the marinade sounds seriously amazing and flavorful. Really looking forward to trying this recipe! It looks like another great one. My first experience with lamb was TERRIBLE. So glad I decided to give it another try…and cook it myself. Now we LOVE lamb, and this recipe looks totally mouthwatering. I will be giving it a try soon. Oh No! That’s terrible. I am glad you decided to give it another try. We love it here in our home. Love lamb chops! Sounds delicious! Oh I love me a good lamb recipe and cast iron cooking too! I love all of the fresh parley and rosemary in this! It’s such a yummy flavor with the lamb. This would be a lovely meal to serve to loved ones too. These look amazing! Mouth-watering lamb chops with a fresh topping looks like the perfect combo. These lamb chops look so delicious! I love rosemary with lamb, so this marinade looks perfect! Can I just say that this looks so delicious, even to me, someone who has never eaten lamb before! I love the ingredients you paired together for the marinade/sauce. These lamb chops look so moist and flavorful. I will definitely be making this! I absolutely love lamb chops! The marinade is just delicious! I love pairing mint in any marinade for lamb! Such an easy and tasty recipe! Lamb is also our favorite protein at our house. My husband makes a very similar recipe but never have we mixed all the ingredients in the food processor. Such a great idea. 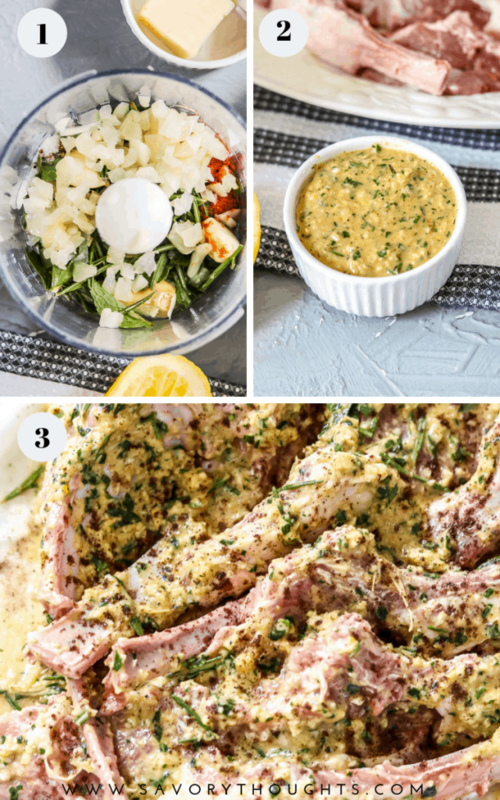 I already fell in love with the recipe when I saw the images but when I read that lamb was marinated with mint – I got incredibly excited. This is the type of recipes I want to cook, enjoy and spread the word about – fantastic way to make a perfect dinner! I think I’ll give this a try, it looks great – i’ve only ever done a shoulder roast before! chop time now! I am loving the seasoning mix you used! Yum! My parents love lamb and this would be a perfect meal for them! I can’t wait to try it. I love the sound of this recipe. When I bake lamb chops it’s only ever with mustard and brown sugar but your recipe looks scrumptious and it’s good not to always cook things the same way! Def want to try it! I’ll have to try it with mustard and brown sugar only. Thanks for sharing. I grew up on lamb chops. Yours look amazing! This sounds delicious and filled with all kinds of flavor! I love lamb chops! This marinade has such great flavours. Thanks for sharing! Yes for baked lamb chops and that marinade looks flavorful! 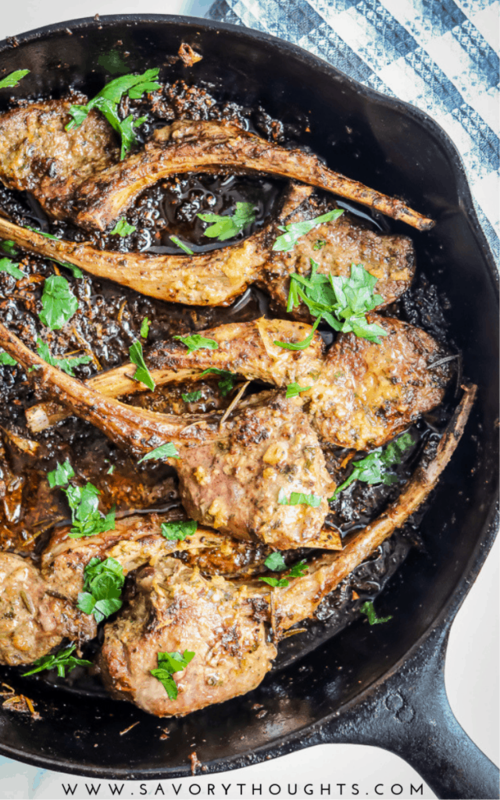 I love lamb chops but I’ve never tried them at home -thanks for this super simple recipe! I can’t wait to taste them! Mirlene, it’s awesome! I cannot wait to try this. I bet it makes the house smell divine and tastes incredible! Mirlene, t’s really awesome! This will quickly become a favorite in our house! I’ve been scared to cook lamb for my family but this recipe seems like something they would love. The flavors you put together makes me think my kids will LOVE this!